With a range of Free Trade Agreements, Georgia has access to a 900 million market that is not subject to customs tax, including Turkey, CIS and EU countries. In recent years the Georgian economy has proved its resilience to external shocks, fluctuations of commodity prices and regional turbulence. In 2017 year, the real growth of GDP has accounted to 4.8% growth, which makes Georgia one of the fastest growing economies in the region. Government spending in infrastructure in coming years is budgeted at 3.7 billion USD. The country has diversified economic structure with largest single sector contribution not exceeding 17% of total Gross Domestic Product. Among leading sector of Georgian economies are trade, manufacturing, transport and communication, hospitality and financial services. According to the latest economic outlooks produced by the IMF, Georgia’s real GDP growth by 2022 year will accelerate to over 5% annual growth. Georgia’s liberal trade regimes provide investors with a favorable opportunity to not only access the country’s 3.7 m residents, but the wider region’s markets, as a direct result of the absence of customs and import tariffs. 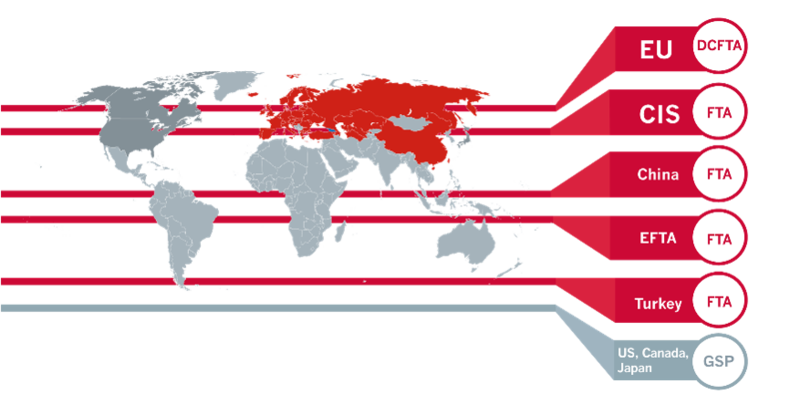 To date, Georgia has signed FTAs with CIS countries that include Ukraine, Belarus, Moldova, Kazakhstan, Kyrgyzstan, Tajikistan, Uzbekistan and Turkmenistan, as well as its neighbors, Turkey, Azerbaijan and Armenia. Since 2014, Georgia enjoys Deep and Comprehensive Free Trade Area with the European Union, which mean tariff free trade for product and service with all EU28 states. In addition, Georgia signed FTA agreements with the EFTA countries (Switzerland, Norway, Iceland and Liechtenstein), which in total represents 14 million populated consumer market with high purchasing power. Free Trade Agreement between Georgia and China has come into play on January 1, 2018, making Georgia the first country in the region to have such a deal with China. In terms of border control, all foreign travelers to Georgia enjoy highly accessible and service-oriented customs policies and administrative protocol. There is almost no custom duty, with 90 % of goods being exempt from import tariffs, with no quantitative restrictions. The average time for customs clearance is currently about 15 minutes – one of the fastest and most efficient in the CIS. Georgia is a country with low tax rates and transparent tax system. Tax and customs legislation is unified under one tax code and the collection of taxes and supervision of the tax environment is provided by Georgia Revenue Service. All tax administration procedures and customs clearances are online/web-based. Georgia has 5 taxes related to business activities all of which are flat. 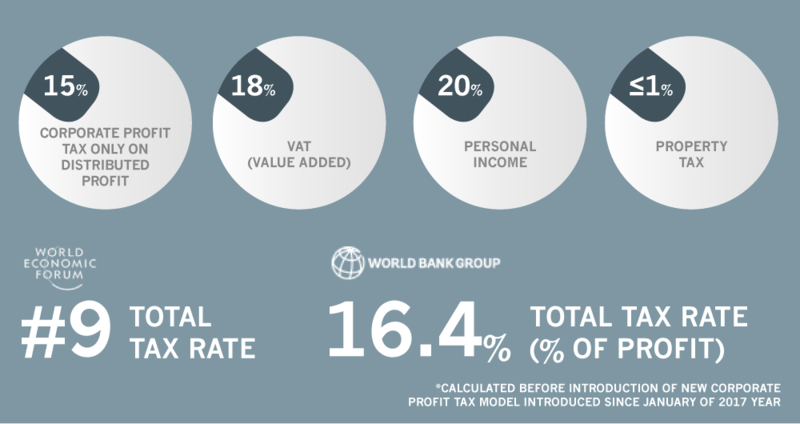 In 2017 year, the Government of Georgia introduced new growth oriented model of Corporate Income Tax. The main amendment under the new model is postponing taxation of corporate income until distribution of net income. This increases availability of the funds and promote reinvestment of earned profits into the same or new activities. The Economic Liberty Act adopted by the Parliament of Georgia as an article in the Constitution which restricts the right of the Government of Georgia to introduce new taxes or to increase existing rates without calling a national referendum. As of 2018 year, Georgia has double taxation avoidance treaties with 54 countries.